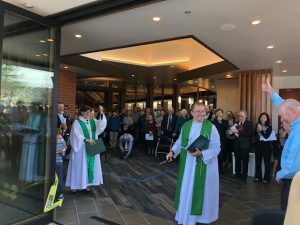 This Sunday Studio Bergtraun attended the beautiful ribbon cutting ceremony for Grace Lutheran Church new Narthex. The Bishop came specially to bless it and it was wonderful to witness the feelings of community and renewal that accomplishing this new space brought on. This IS what architecture is all about! !